Own Back To The Future - Delorean Mug from Deff, DVD, Blu-Ray & 4K Video Specialists - Free UK Delivery..
Brace yourself - as the most spectacular history-altering adventure of all time continues in the hit sequel that proves lightning can strike twice! Marty and Doc (Michael J. Fox and Christopher Lloyd) have barely recovered from their first time-travelling adventure when they launch themselves once more into the space-time continuum. But this time around, their attempt to fine-tune the future in the year 2015 creates an outlandish, alter..
Michael J. Fox and Christopher Lloyd are joined by Oscar winner Mary Steenburgen in this rousing, full-throttle conclusion to the epic time travelling adventure trilogy from the powerhouse team of Steven Spielberg and Robert Zemeckis. Fulfilling a long time fantasy, Doc Brown has decided to live in the Old West of the 1880's. But when he’s in danger of meeting an untimely end, Marty travels back in time to rescue him. There’s just one p..
Own Back To The Future Blu-Ray from Deff, DVD, Blu-Ray & 4K Video Specialists - Free UK Delivery..
From the Academy Award-winning team of Steven Spielberg and Robert Zemeckis comes the hilariously original, groundbreaking adventure that thrilled critics and audiences alike - and sparked one of the most successful movie trilogies ever! The year is 1985 - but not for long. Because teenager Marty McFly (Michael J. Fox) is about to be blasted back to 1955 aboard the plutonium-powered DeLorean created by eccentric genius Doc Emmett Brown ..
Join Marty McFly (Michael J Fox) Doc Brown (Christopher Lloyd) and a time travelling DeLorean for the adventure of a lifetime as they travel to the past, present and future, setting off a time-shattering chain reaction that disrupts the space-time cuntinuum! From filmmakers Steven Spielberg, Robert Zemeckis and Bob Gale, this unforgettable collection includes all 3 movies and all-new bonus disc including documentary, Back to the Future ..
Back to the Future: The future for 17-year-old Marty McFly is not shaping up well. His family is dysfunctional, his schoolteacher, Mr Strickland, is out to get him, his music is just too loud and the rest of the world doesn't care. Only with his girlfriend, Jennifer Parker and local eccentric scientist, Dr Emmet Brown does he find the encouragement and excitement he needs. Never in time for his classes or his dinner, one day Marty wasn'..
Own Back To The Future Trilogy DVD from Deff, DVD, Blu-Ray & 4K Video Specialists - Free UK Delivery..
Return to the disco days of the 1980s in this exclusive collection, featuring ALL NEW ARTWORK that celebrates Generation X's neon dream decade, and the movies that defined it. One of the top-grossing box office comedies of all time! Steven Spielberg presents an irresistible comic fantasy that accelerates beyond the time barrier with wit, imagination and infectious, wide-eyed wonder. Michael J. Fox stars as Marty McFly, a typical Ameri..
Own Back To The Future - 88MPH Mug from Deff, DVD, Blu-Ray & 4K Video Specialists - Free UK Delivery..
Own Back To The Future - Flux Capacitor Mug from Deff, DVD, Blu-Ray & 4K Video Specialists - Free UK Delivery..
Own Back To The Future - Hoverboard Mug from Deff, DVD, Blu-Ray & 4K Video Specialists - Free UK Delivery..
Own Back To The Future - License Plate Mug from Deff, DVD, Blu-Ray & 4K Video Specialists - Free UK Delivery..
Own Back To The Future - Mr Fusion Mug from Deff, DVD, Blu-Ray & 4K Video Specialists - Free UK Delivery..
Marty and Doc (Michael J. Fox and Christopher Lloyd) have barely recovered from their first time-travelling adventure when they launch themselves once more into the space-time continuum. 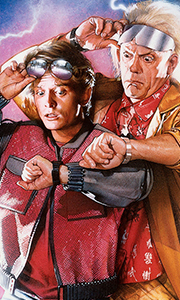 But this time around, their attempt to fine-tune the future in the year 2015 creates an outlandish, alternate 1985 Hill Valley where bully Biff Tannen is rich, powerful and... Marty's dad! Now, their only chance to fix the present is by going back to 19..